There are few movie franchises more successful than the "Fast and Furious" and to help commemorate that Xbox has designed a custom Xbox One S console modeled after Paul Walker's first car from "The Fast and the Furious." 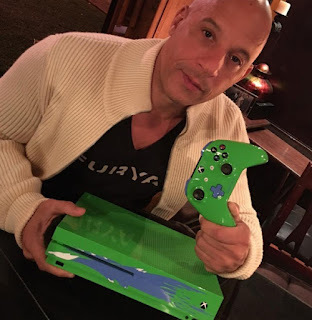 The unique console has the same bright green and blue design as the car used in the opening scene and in the first ever race between Vin Diesel and Paul Walker. The console is a true piece of memorabilia for not only fans of the movie franchise but for Xbox fans as well and is signed by some of Paul Walker's closest friends and castmates including Vin Diesel, Tyrese Gibson, Cody Walker, Paul Walker's brother and more. One fan will have the opportunity to own the custom console as it will be raffled off on October 1, when Xbox is partnering with Reach Out WorldWide (ROWW) to host their third-annual livestream charity event Game4Paul. The event honors Paul Walker and his passion for people and spreading good will. All proceeds raised by the console auction will go directly back to ROWW, a disaster relief nonprofit, founded by Paul Walker, with the purpose of providing quick and efficient relief to those who need it most in the chaos after a natural disaster. Raffle tickets can be purchased now at game4paul.com. "I loved the idea of Xbox going back to when it first started for Paul and The Fast and the Furious with this awesome custom console design," Cody Walker, Paul's brother and CEO of Reach Out WorldWide, said. "It's so important for the work of ROWW to continue and we're so appreciative of Xbox designing this Xbox One S and raffling it off as part of our Game4Paul livestream." "Our Xbox family is so proud to play a very small part in remembering Paul's great career and work with ROWW," Aaron Greenberg, GM of Games Marketing at Xbox, said. "The team put a lot of thought into this custom console design and we are thrilled to pay homage to Paul unforgettable Fast and Furious character." Fans who want to take part in the raffle or anyone looking to support ROWW can contribute and watch Game4Paul live at game4paul.com, and through the Mixer Xbox Channel, Twitch Xbox Channel and Cody Walker's Facebook page.